Port of Salalah is warning that an impending trade war between the United States and major economic powers, combined with Washington’s decision to reinstate sanctions against Iran, will negatively impact its operations — both on the Container and General Cargo sides of its business. 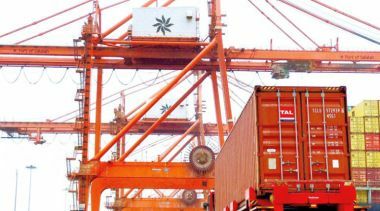 The looming challenges threaten to compound Salalah Port’s woes as it continues to grapple with the devastating aftermath of Cyclone Mekunu, which ravages the hub and indeed large swathes of Dhofar’s coast. “The escalating trade war between the US and its closest traditional trading partners coupled with its current international policy decisions in US will impact global GDP growth and thus seaborne trade globally,” said Ahmed bin Nasser al Mehrzi, Chairman, Board of Directors, Salalah Port Services Co SAOG. “These conditions likely to impact the Port of Salalah in various ways that needs to be closely monitored. Also noteworthy is the US withdrawal of multiparty agreement (P5+1) and reinstating of sanctions with Iran and Iranian entities globally,” he stated in the Directors’ Report for the half-year ended June 30, 2018. As with a number of international companies that are pondering an exit from Iran to protect themselves from US punitive action, Salalah Port too is also weighing the implications of sanctions on its modest dealings with Tehran, according to the Chairman. “The Port of Salalah is now reviewing our current practices and dealings (albeit very limited) with Iranian entities and businesses to determine how to comply with the new US regulations,” Al Mehrzi noted. Already, the impending global trade war is impacting the international container shipping business, the Chairman warned. “In addition to the Iranian sanctions, the looming trade war is already showing signs of impacting the routing and capacity of container shipping lines. Some shipping lines already planned to reduce capacity on the transpacific trades in anticipation of reduced volumes between China and the US. This may potentially have the unintended consequence of more demand on the Asia-North Europe trade which could result in more volumes via the Gulf region,” Al Mehrzi said. Some impact is also anticipated on the port’s general cargo business, particularly with regard to its exports of bulk minerals such as limestone, which is a key ingredient in the production of steel — a commodity now covered by US tariff increases. “The US tariffs on steel could mean a drop in demand in limestone exports, but the re-imposing of the Iranian sanctions seems to bedriving an increase in demand on Omani gypsum exports,” Al Mehrzi noted. The Directors Report, published on the website of the Muscat Securities Market (MSM) yesterday, also provides a detailed account of the extensive damage caused by Cyclone Mekunu when it made landfall on May 25, 2018. The torrential rain and tidal surge triggered by the cyclone left significant parts of the terminal submerged under two metres of water, according to the Chairman. Silt and debris deposited by the floodwaters covered much of the terminal, effectively putting the maintenance workshops, storerooms, terminal tractors and RTG cranes out of operation. “Many other areas of the terminal were severely affected by the floodwater including damages to breakwater and power plant being submerged in water. Several unauthorised dhows that used the port as shelter were sunk, in addition silt from wadis deposited in the basin resulted in loss of depth. A few buildings and employee housing facilities were badly damaged,” Al Mehrzi explained. Cyclone Mekunu, the official pointed out, caused “significant damage and destruction to property, equipment and infrastructure” at the port. Consequently, port operations were suspended for nearly 10 days at the Container Terminal from May 24 to June 3, 2018 and for about a week at the General Cargo Terminal from May 24-29, 2018. Two months on, operations have yet to be restored to pre-cyclone levels, according to the Chairman. Berths 1 and 3 at the Container Terminal, as well as Berths 30 and 31 at the General Cargo Terminal are still unavailable. Additionally, the loss of harbour draft and reduced equipment availability are hampering efforts to return to pre-cyclone levels. “The Port is adequately insured for property and business interruption,” Al Mehrzi said, adding that a detailed assessment of the damage is currently under way.